WARNING: This page under construction! The following is an overview of the AES-CMM attack done by Eyal Ronen et al., detailed in their draft/limited release paper IoT Goes Nuclear: Creating a ZigBee Chain Reaction (research paper website), IACR E-print submission. If using this attack please do not cite this page, instead cite the research paper only. The paper is currently a draft so there is no proceedings information etc as it has not yet been presented anywhere, but you can cite the E-Print version. This page is presented as an example of using Python/ChipWhisperer to perform attacks against the AES-CCM cipher, without needing to do a more complex attack against AES-CTR mode. 3.1 Breaking AES-CBC Encryption with unknown I.V. 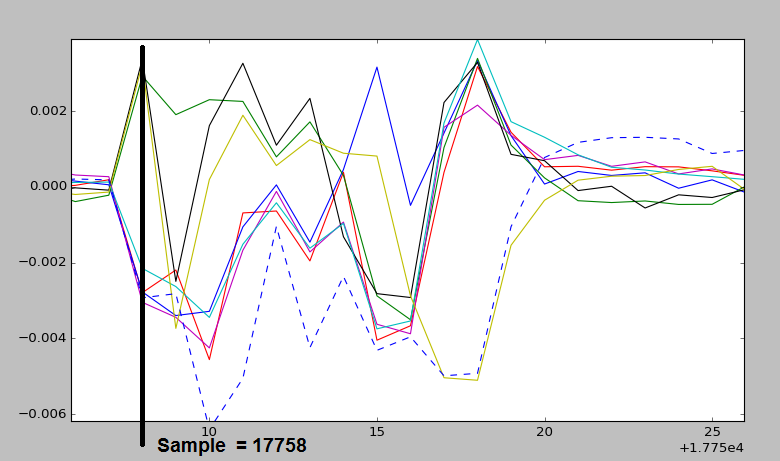 The "Calculated Tag" and "Expected Tag" are compared together, and only if they match is the decrypted data used. A change of any of the data blocks OR the header would change the calculated tag, resulting in an error. Can decrypt any data block, or decrypt blocks out of order due to AES-CTR usage. Authentication Tag provides authentication that data has not been modified in transit. Auth tag can include non-encrypted information, such as a header with address or length information. Auth tag can be shortened (i.e., not full 16-byte length) for use with protocols with very sensitive length limitations. 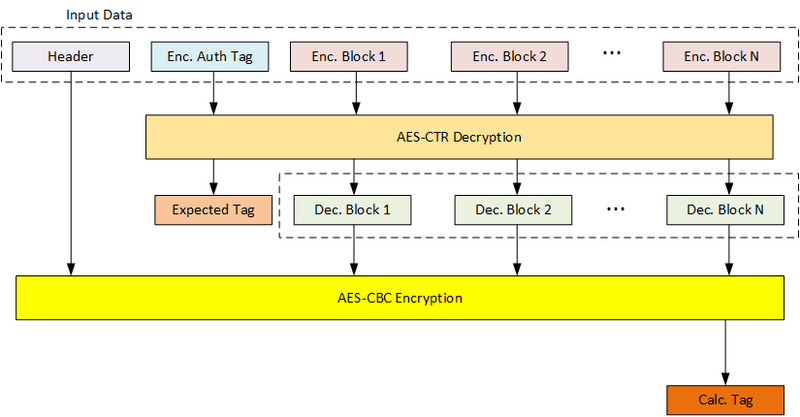 In AES-CCM mode, the AES-CBC encryption is used to generate a nice "authentication tag". If a single byte changed anywhere in the data fed into the AES-CBC block, the final output will differ. The AES-CTR mode is used for the actual data encryption. Note AES-CTR encryption and decryption is the same operation, as AES-CTR is basically generating a unique "pad" we XOR with the data. A nonce format is required for AES-CTR. This nonce can be based on information in the packet, such as source address, or be random. An IV is required for the AES-CCM block. This I.V. can be sent (possibly encrypted) to the AES-CCM block, or be part of secret information stored in the bootloader. To perform this attack, we will define a simple bootloader. We will be using this example since we cannot use AES-CCM "standalone" without having a little bit of structure (i.e., how we do the AES-ECB demos). This `bootloader' is really just a demo of something that downloads a block of encrypted data, since it doesn't perform any actual bootloading. Each block sent to the bootloader is 19 bytes long. The first byte indicates the type - header, auth tag, or data. If a new 'header' message is received it will abort any ongoing processing of existing data and restart the bootloader process. Header Info: 14 bytes of "header" data which could be version or other such stuff. Length: Number of encrypted data frames (NOT including the auth-tag frame) that will follow. 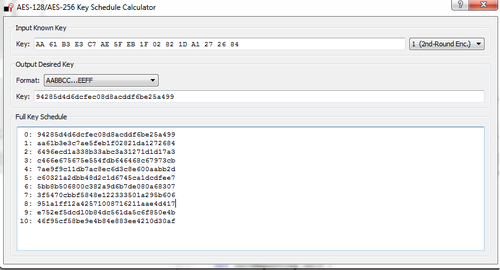 Note the 16 bytes of the header info + length are fed into the AES-CBC algorithm as part of the auth-tag generation. That is this data is authenticated but not encrypted. Auth-Tag: The expected output of the AES-CBC algorithm after processing the authenticated only data + decrypted data frames. This is then encrypted in AES-CTR mode with the CTR set to 0. Encrypted Data: Data encrypted in AES-CTR mode, with the CTR starting at 1 and incrementing. Note details of the AES-CTR nonce, AES-CBC I.V., and key are stored in the firmware itself. In this example they are not downloaded as part of the encrypted firmware file. The following will use the notation from IoT Goes Nuclear: Creating a ZigBee Chain Reaction. This notation will be adopted throughout this wiki page. From the figure of AES-CCM, you can see that we don't directly control the input to any of the AES blocks. It could be possible to perform an AES-CTR attack (such as described by J. Jaffe in A First-Order DPA Attack Against AES in Counter Mode with Unknown Initial Counter), but this will have issues if the bootloader limits the number of blocks we can send. But, as it turns out we can still break AES-CBC with a little additional computational effort (but not requiring any additional traces). Breaking AES-CBC Encryption with unknown I.V. If you've performed a standard CPA attack, you'll realize the problem with attacking AES-CBC is we don't directly control the input, which we call . Instead it's XORd with some unknown bytes (the AES-CBC ciphertext output). But if we are always attacking the same block (that is, we reset the AES state to initial by say resetting the device, and rerun the algorithm up to the first block), the unknown bytes are constant. As it turns out this is a pretty easy problem to solve. The first step is to perform a standard CPA attack. The only issue is we won't recover the actual encryption key used , instead we recover , since we basically roll all the constant inputs into what we call a `modified key'. Note is the output of the previous-block AES-CBC ciphertext. Where the basically includes those additional constants, instead of them being added to the plaintext as part of the input processing. Ultimately it means the output of AddRoundKey, and thus processing of later rounds, is identical in both cases. So we can perform a CPA attack on the 2nd-round key, and directly recover the "true" first-round key by rolling back the key schedule. This is the solution now - we simply perform a CPA attack on the 2nd round of the AES algorithm, where we use the AES algorithm to determine the inputs to the second-round based on our modified key & the known plaintext. There is an example of a simple bootloader which uses AES-CCM in the firmware directory. A hex-file is also present for the Atmel XMEGA device on the ChipWhisperer-Lite board. Program into the target the aes-ccm bootloader. This bootloader can be found in the git repo, which also includes a .hex file. Set the target type to the special AES-CCM bootloader driver. This target module is detailed in the appendix on this page, you can copy that code into a new file in the `target' directory. Run a capture with ~500 traces. 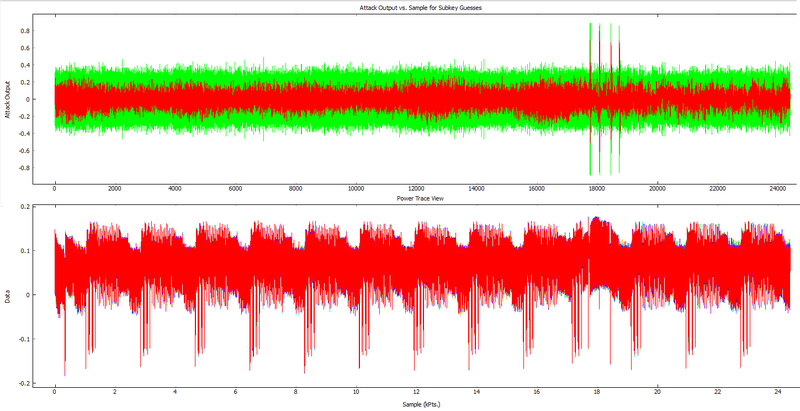 Use 1x CLKGEN for the ADC speed and the full point-range to be able to capture both software AES rounds. See capture script example for details. I've gone out of my way & marked the location of AES on it. Let's assume you didn't have that - why might you do? We can actually first do a CPA attack with the "XOR" leakage model to determine where data is being manipulated. Only enable a single subkey (i.e., say byte 0). Set reporting interval & traces per attack to same value (say 100 I used here). XOR of AES-CTR output 'pad' with input CT.
XOR of previous with the old AES-CBC state as part of AES-CBC input processing. AddRoundKey of previous during AES-ECB block. The first step is to perform a standard CPA attack. Remember we won't recover the actual encryption key used , instead we recover , since we basically roll all the constant inputs into what we call a `modified key'. Turn back on all bytes (if previously disabled). Switch leakage model to S-Box output. You'll likely find after a number of traces you could plot correlation for bytes 0 & 15, and get a better idea where the attack should happen. Looking at the following I can see we could focus on points (18600,19200) and might get a more reliable attack. The next step is to use this to recover the complete round-key. In what might seem like magic, we can use this modified key to directly determine the second-round key (the true key). This was originally presented by J. Jaffe in A First-Order DPA Attack Against AES in Counter Mode with Unknown Initial Counter, and details were described earlier in this page. For our case we are using , that is we don't have directly, but we actually have the input to the AES-CTR decryption. Ultimately the AES-CTR output will become another unknown constant we will deal with later. Where the basically includes those additional constants, instead of them being added as part of the ciphertext. Ultimately it means the output of AddRoundKey, and thus processing of later rounds, is identical in both cases. So we can perform a CPA attack on the 2nd-round key, and directly recover the "true" first-round key by rolling back the key schedule. Note in addition you can perform the operation to recover . If we knew either one of those we could then completely break AES-CCM, since we would know the AES-CBC I.V., along with the AES-CTR nonce/format. For a well-known implementation (say in IEEE 802.15.4) we are done, as the nonce format is known. You can perform an encryption with the known nonce to recover , then immediately recover . Note this isn't the true I.V. as written in the file, but the result of the AES-CBC state up until the first encryption block was performed. Thus you cannot change the authentication-only blocks without doing further work to reverse back to the original I.V. In the event the AES-CTR nonce input is unknown, additional work is required (detailed below). Repeating this for block #2 is exactly the same as before. Note you will need to perform a capture which triggers on the second block, which may require changes to the firmware source code. Once you recover Block #1, you can calculate . Recovering block #2 means you could use to determine . Then you can decrypt to determine the AES-CTR nonce format. As an alternative to doing the CPA attack on a second block, we can use a DPA attack to figure out the AES-CTR output pad. The advantage of the DPA attack method is it doesn't require any additional traces to be captured. Now we'll simply go through and read off each bit by deciding if it's above/below zero. Note that (a) there is multiple potential threshold locations, and (b) you might get the inverse of the correct answer (each bit flipped) depending on your hardware. In practice we might need to test a few possible locations. This gives us the decrypted value of c1 25 68 df e7 d3 19 da 10 e2 41 71 33 b0 00 01. This happens to be the same value as saved in the bootloader supersecret.h file, with the expected counter values. So it looks like our attack was a success! We now know the AES-CTR nonce. NB: The nonce in your firmware file (saved in supersecret.h) will probably be different from this. This page was last modified on 26 March 2017, at 14:45.